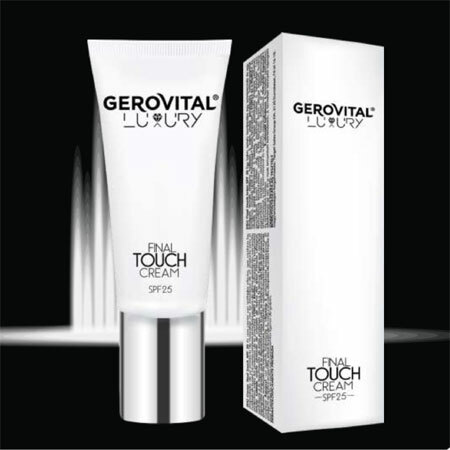 The Gerovital Luxury Final Touch Cream SPF25 is a multiple effect moisturizer which combines the properties of a make-up product with the benefits of a skin care product. The cream contains state of the art active principles with a protective action for the youth proteins FOXO and KLOTHO, increasing cellular longevity. Lakesis, the precious oil extracted from the crystallized resin of Pistacia Lentiscus contributes in the reactivation of these proteins. Due to the easy texture containing mineral pigments which lay-down in a fine layer on the skin’s surface, an immediate rejuvenation effect is obtained, masking imperfections, smoothing and leveling the complexion’s color. It contains Aquaxyl – a moisturizing agent and Vitamin E, an exceptional antioxidant. Usage: Apply in the morning to clean face, neck and décolletageusing light tapping movements. The moisturizer is an excellent base for make-up. Apply in the morning to clean face, neck and décolletageusing light tapping movements. INGREDIENTS: AQUA, ZINC OXIDE (NANO), ETHYLHEXYL METHOXYCINNAMATE, MICA, ZINC OXIDE, CYCLOPENTASILOXANE, ISONONYL ISONONANOATE, TITANIUM DIOXIDE, OCTYLDODECANOL, TRIETHOXYCAPRYLYLSILANE, XYLITYLGLUCOSIDE, ISOSTEARIC ACID, ANHYDROXYLITOL, GLYCERIN, C12-15 ALKYL BENZOATE, POLYGLYCERYL- 3 DIISOSTERATE, 2-PHENOXYETHANOL, HYDROXYETHYL ACRYLATE / SODIUM ACRYLOYLDIMETHYL TAURATE COPOLYMER, OCTYLDODECYL XYLOSIDE, PEG-30 DIPOLYHYDROXYSTEARATE, XYLITOL, ETHYLENE/PROPYLENE/STYRENE COPOLYMER, SORBITAN ISOSTEARATE, POLYSORBATE 60, ETHYLHEXYLGLYCERIN, PARFUM, BENZYL SALICYLATE, LIMONENE, LINALOOL, CITRONELLOL. GERANIOL, TETRASODIUM EDTA, SODIUM HYDROXIDE, BHT, CI 77891, CI 77492, CI 77491, CI 77499.